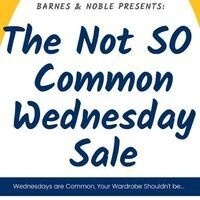 Join the Bookstore in Wilson Commons-Bridge Lounge for "The Not SO Common Wednesday Sale" during this coming Wilson Commons Wednesday! We will have clearance items and a snap shot of regular priced items for Faculty, Staff and Students to buy! FACULTY STAFF DON'T FORGET: YOU GET 10% OFF AT the BOOKSTORE! STUDENTS: PAY IN Uros & GET 5% OFF your Transaction!! This was a great sale. I loved the selection and the prices.